Bunratty Castle is a large family mansion, located in County Clare. This imposing medieval castle, locked by massive towers, is located in the central part of the same name village Bunratty which is not far from Shannon town and its airport. The name of the Irish castle literally translates as "fortress of the end of the course”. 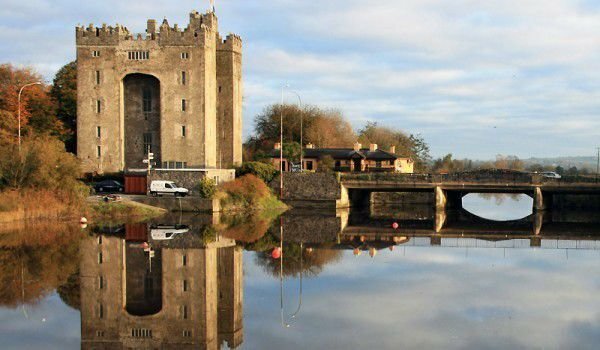 Perhaps it stems from the fact that the entire length of Bunratty has a running river, which flows to a nearby estuary of the River Shannon. From the top of the castle Bunratty there is a comprehensive view of the whole estuary and the airport in the city. Today around the castle visitors are able to walk in both the fortress which was built in the 19th century and the folk park. The palace itself is considered the most authentic medieval fortress across Ireland. It was built in 1425 by the McNamara family. 50 years later, the palace fell into the hands of the O'Briens. In the 18th century the castle Bunratty was in the possession of the Studdert family, which abandoned the mansion in 1804 and condemned it to destruction. They settled in nearby more modern and luxurious buildings. The family left the castle Bunratty, arguing that they need more space after their eldest daughter goes into marriage with her first cousin. And today the castle Bunratty and the buildings where they lived are open for public visits. The castle itself was rebuilt in 1954, having returned it all to its former medieval splendor. Today the interior of the mansion is made up of furniture, typical of the 15th and 16th century. Visitors can see a large number of interesting tapestries and works of art that transforms the atmosphere of the time. In castle Bunratty you can see the best collection of medieval furniture in the territory of Ireland. The castle Bunratty exposes over 450 exhibits. Each piece of furniture or object of art is well mounted with the accompanying description or photograph that complements the information of its origin. Today the castle Bunratty is open daily for visits to 4 pm. Quite often here at night are organized lavish parties and medieval banquets. Around the castle there is a lovely garden with an interesting Victorian building, surrounded by flowers, fruit and vegetable crops.